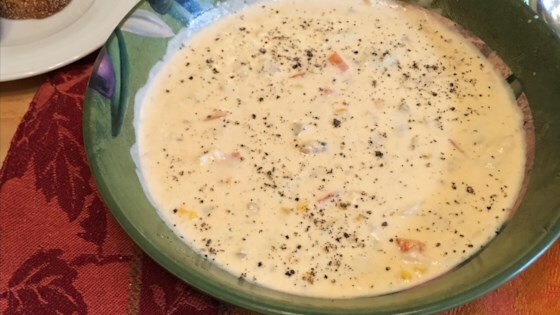 "This is not a thick soup, yet it is creamy and so smooth to the palette. The aroma when cooking makes you want some before the potatoes are soft. I have made modifications due to allergy to corn (such as rice flour). I allow mine to slow-simmer with lid slightly ajar. Stir often so the film does not form on top. I have doubled my batch and still never have any for the freezer." Spray a stockpot with cooking spray. Melt butter in the prepared stockpot over medium heat; cook and stir celery, onion, paprika, seafood seasoning, thyme, salt, and white pepper until onion is translucent, about 5 minutes. Whisk flour into vegetable mixture until smooth and dissolved. Pour seafood stock over vegetable mixture. Mix half-and-half, cream, and milk into broth mixture; decrease heat and simmer until bisque is thickened, about 15 minutes. Add crabmeat and simmer bisque until crabmeat is heated through, about 5 minutes more. All-purpose flour can be used in place of rice flour. Chicken or vegetable stock can be substituted for seafood stock. Shrimp or lobster can be substituted for crab. You can add chopped potatoes and carrots if desired. Took a little time to prepare, but was worth it. Very rich and delicious! For the stock I used shells from crayfish, then used shrimp in place of crabmeat. I’ll definitely make it again. Fantastic soup!! Added a hint of sherry at the end.